This caricature is of George Lashwood topping the bill at the Grand Theatre of Varieties, Hanley, during the week of 22 October 1906. It is one of the many superb caricatures of Edwardian music hall performers that were drawn by the artist George Cooke when he was based in Hanley. He compiled them in a series of albums. George Lashwood (1863–1942) made his first provincial stage appearance in 1883 and his London debut at the Middlesex Music Hall in 1893. He was known as the ‘Beau Brummell of the Halls’ because of his sartorial style of dress. He became successful for singing popular and patriotic songs, including ‘The Death and Glory Boys’, ‘The Gallant Twenty-First’, ‘Where Are the Lads from the Village Tonight?’, ‘After the Ball’ and ‘In the Twi-Twi-Light’. At Hanley he sang the song ‘On Top of the Tramcar’ and performed a ‘scena’ called ‘West End’. He was ‘vociferously recalled and applauded’ for these. Pen, ink and wash caricature on pink paper of George Lashwood, head and shoulders, showing him wearing a stiff white collar and white bow tie. 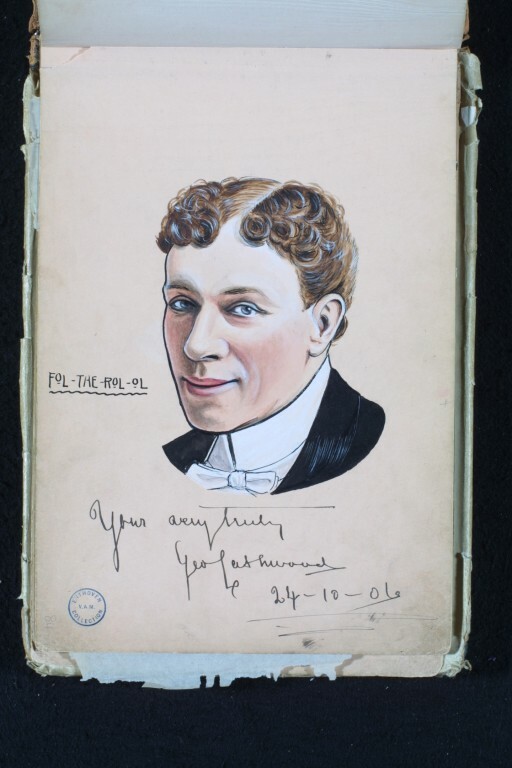 This caricature is of the music hall performer the comedian and 'descriptive vocalist' George Lashwood (1863-1942), known as the 'Beau Brummell of the Halls', who became successful for singing popular and patriotic songs. He retired after the first world war to farm in Worcestershire. The caricature comes from the second album of caricatures in a collection of albums compiled by the graphic artist George Cooke. It is labelled by the artist 'Geo Cooke HYS BOOKE' and features music hall performers working in the early 20th century. 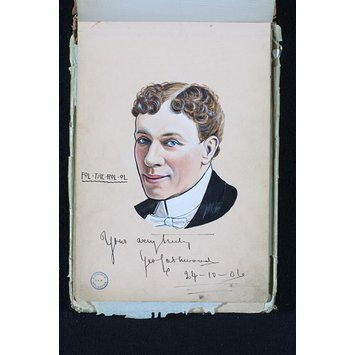 Caricature of the music hall comedian and singer George Lashwood (1863-1942), from an album of caricatures drawn by George Cooke. October 1906.